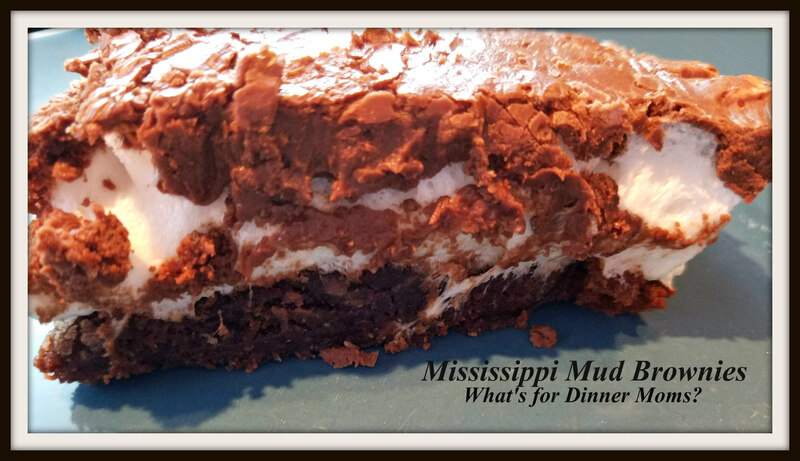 Week 6 Christmas Treats: Mississippi Mud Brownies – What's for Dinner Moms? When I was younger I was the master of making unique desserts out of boxed brownie mixes. Then I discovered the joy of homemade brownies. I could whip up a batch in no time. But, lately my kids have wanted to make brownies from a box. I am fine with that. They both know how to make homemade brownies but think the box kind is so much easier. They will learn. I have been starting to teach them how to make them better by just adding a few ingredients. This is one of my favorites. A bag of mini marshmallows and some frosting make these really decadent sweet brownies. You would never know these are made with a simple boxed brownie mix. They are so rich and delicious. Be careful when cooking the marshmallows that you only let them puff up and not burn around the edges or they will be crunchy and not chewy. The frosting is nice and sweet but you could also use a can of pre-made chocolate frosting melted slightly in the microwave poured over the top if you don’t want to make frosting. So many different ways to make these brownies! Make them your own! A delicious dessert that can be made with a boxed brownie mix. Make and bake brownies according to package directions. When brownies are done remove them from the oven and spread the mini marshmallows over the top of the brownies evenly. Return pan to oven for 1-2 minutes until brownies puff up and melt together. Remove brownies from oven and cool completely. Beat together butter, cocoa powder, milk, vanilla, and powdered sugar until smooth. Frost the brownies and serve. And they are so simple to make! I really like your frosting recipe, Marci.